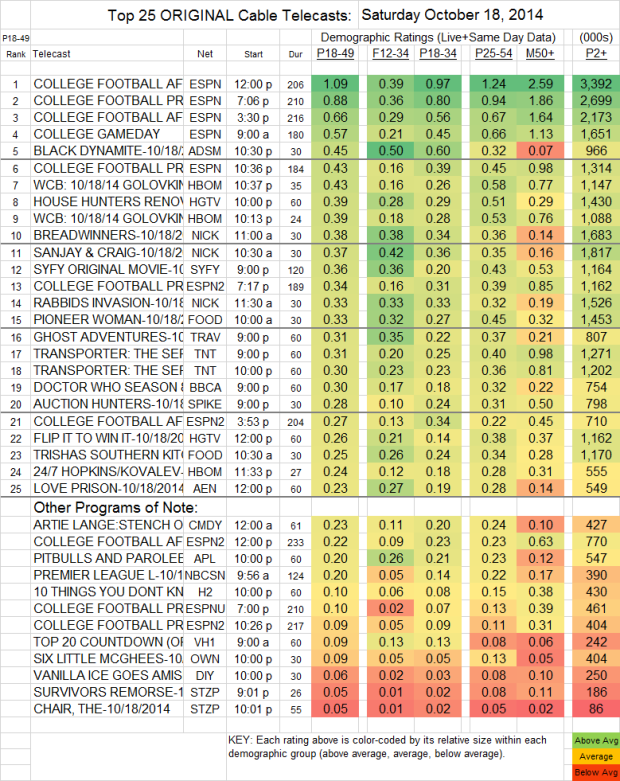 7 of the Top 10 shows on Saturday cable were sports, led by 0.43-1.09 ratings for ESPN’s COLLEGE FOOTBALL coverage, and 0.39/0.43 for HBO’s BOXING. The highest rated non-sports show of the night was Lifetime’s original movie BIG DRIVER (which didn’t make the list below for technical reasons), at 0.57 and 2.15M total viewers. Below that was the premiere of Adult Swim’s BLACK DYNAMITE at 0.45, with HOUSE HUNTERS (HDTV) at 0.39. TNT’s premiere of THE TRANSPORTER (0.39/0.38) came in below Syfy’s CREATURE CARNAGE (0.36). On Starz, SURVIVOR’S REMORSE and THE CHAIR were marginally up (by 0.01/0.02) to twin 0.05s. In response to a reader request: THE KITCHEN (Food) was at 0.18/923K.